Recorded in many forms including Hallston, Hallstone, Holston, Holston, Holson, Houlson, Houlston, Holsten, Howlston, and Howliston, this is apparently an English locational surname. 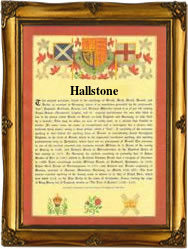 It probably originates from the two villages called Halston, both in the county of Shropshire, one near Shrewsbury and the other Oswestry. Both villages have been heavily depopulated, and by 1950 the place near Shrewsbury was recorded as only having nineteen inhabitants, whilst the other was so few as to not be recorded at all! This is not uncommon and particularly so with locational surnames. It is estimated that over five thousand surnames of the British Isles do originate from places that have either disappeared completely, or are now so reduced as to be perhaps only a single dwelling. As to why this has occured is open to conjecture. Usually it can be put down to changes in farming practice whereby the change from arable to pastoral sheep farming destroyed the need for many farm workers, and later this was compounded by mechanisation, which finished it off. But other causes such as plague, civil war, and even coastal erosion have played their part. The dictionary of English Place names suggests that the meaning is either the holy stone, perhaps a pagan reference, with the place being first recorded in the famous Domesday Book of 1086 as "Halstune", or the stony hollow, from the Olde English pre 7th century "holh-stan".